Hi Kelly: Thanks for your new ideas with earth bags. I especially like the lighter fill material option. I will seriously consider this technique next year when I get out of Denver. Do you ever hold workshops or conduct tours of your buildings in Crestone? I would love to see them in person since I live here in Colorado and enjoy the Crestone area. We would also walk some labyrinths in your area as I am a builder of one in Denver. Help! 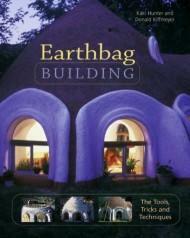 Using "Earthbag Building", I intend to lead a team to build a small project as a training experience in two weeks. I am looking for an Austin, Texas, local supplier for bags, and reject sand. Any leads? Kelly, I am also from Austin, Texas and am planning to build an earthbag dome house this month. I'd love to get in touch with "Anonymous". We have been studying this for awhile and would love to exchange info. Thanks! I live in Taos, NM and started the Taos Papercrete Cooperative. We'll be holding workshops here this summer. My phone number is 575.737.1166, email is cheyenne4995@yahoo.com. This summer I want to visit other papercrete sites, including Crestone, CO and sites in Texas. In fact, I'm on my way to AUSTIN this week. I would love to connect with anyone in or on the way to Austin who is working with papercrete.